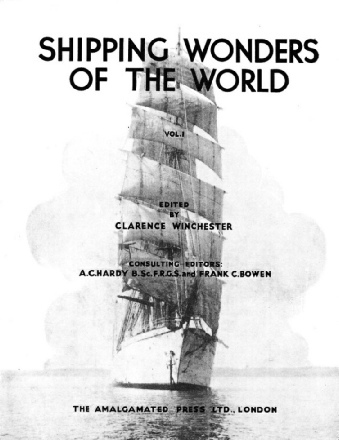 Part 1 of Shipping Wonders of the World was published on Thursday 30th January 1936, price 7d. It was a bumper issue of 36 pages, all other issues being 32 pages. 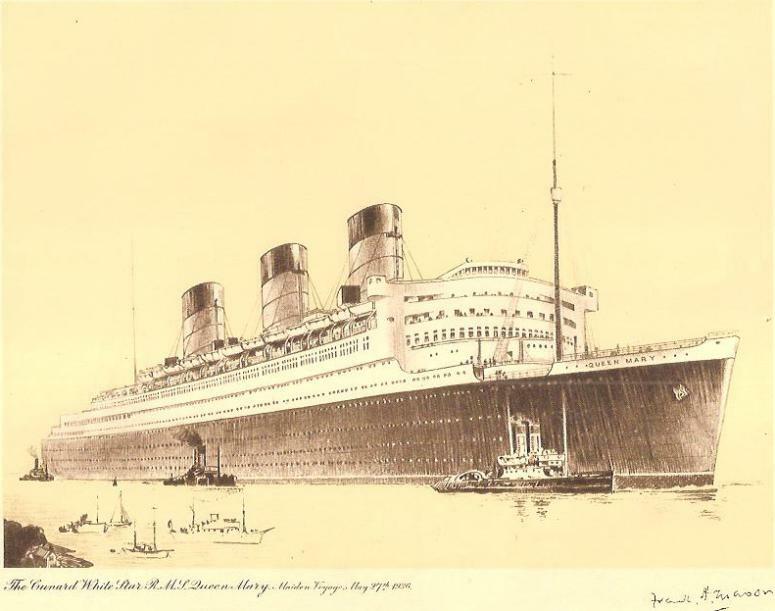 The issue included a superb engraving of the RMS Queen Mary as a separate insert. There was also a colour plate depicting the clipper Ariel, and a central photogravure supplement largely devoted to photographs of the Queen Mary. All these are illustrated below. The cover was designed by the artist Mr K. M. Sibley, “who will provide many of the informative diagrams to illustrate some of the chapters”. Many of the covers were taken from photographs or paintings. Many of them were used as colour plates within the series. Man has written his story upon the water ever since he first went down to the sea in ships. Adventure has succeeded adventure, conquest has followed on conquest, and the wonders of the world have become known. This article is by Sidney Howard. A two-page illustrated article. The drawings are probably by K M Sibley. An introduction to the series by Clarence Winchester. He wrote "I have planned the production to satisfy both the layman and the enthusiast who is not entirely unfamiliar with the subject, and ... I believe that I have constructed a work that may well become ultimately standardized in volume form." The Title Page in part 1 is shown left. 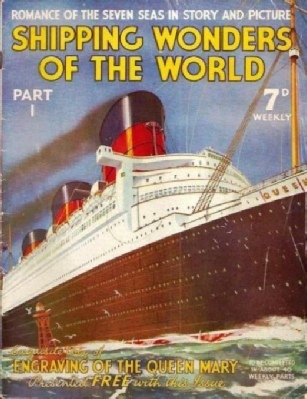 An article on the Queen Mary by Clarence Winchester. Beginning merely as a number - No. 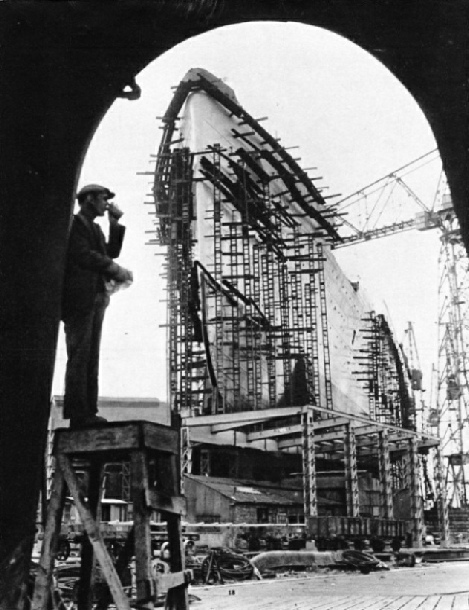 534 - this vessel has grown into Britain’s super-liner, a masterpiece of craftsmanship, a thing of beauty, and a crowning testimony to the brains and fingers of 300,000 people. You can view the British Pathe newsreels of her launch and of her maiden voyage to New York using the links below. This is the first article in the series on The World’s Largest Ships. The “exquisite copy of engraving of the Queen Mary presented free with this issue”. MORE THAN 1,000 FEET LONG. 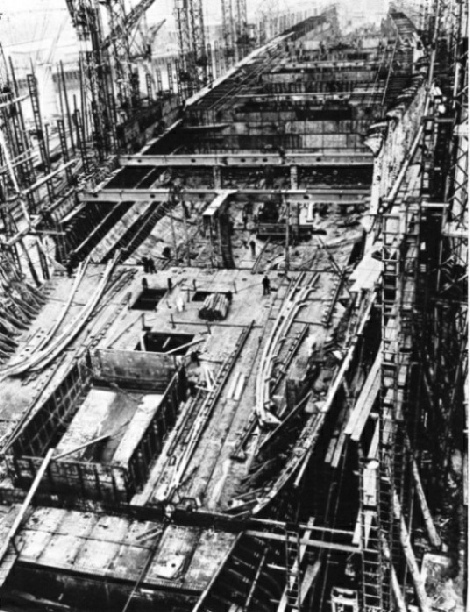 The shell of the Queen Mary in the early days of her construction. 40,000 tons of hand-wrought steel were used and four forests were felled to provide her with timber. Much of the skilled work of the riveters and engineers has been covered by wooden decks and interior decorations. Beneath these are the four main engines, contained in two engine-rooms. There are twenty-seven boilers in the five boiler rooms, with a working pressure of 400 lb per square inch and a steam temperature of 700 degrees Fahrenheit. THE MASSIVE HULL, partly plated. Every shell and deck plate in the ship overlaps other plates surrounding it. The width of the overlap varies from a few inches to well over a foot, according to the number of rivets in the overlap. Note one of the large lifts that were fitted to the sides of the vessel to carry workmen to the upper decks, over 100 feet above ground level. 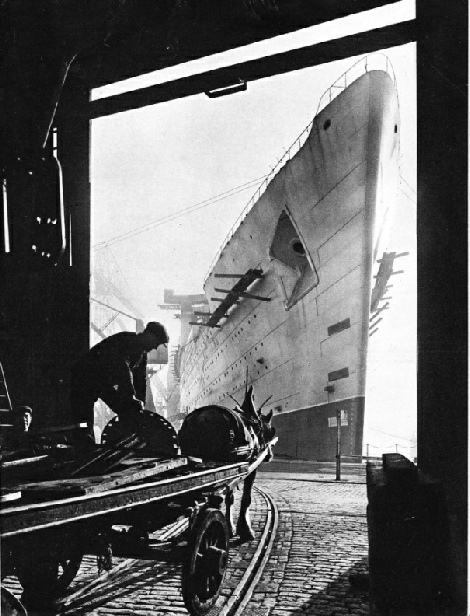 LONG AS A STREET, LOFTY AS A TOWER - the Queen Mary is a striking tribute to the art and ingenuity of the modern shipbuilder. The steel plating of this ship would pave the main road from London to Nottingham, a distance of nearly 125 miles, The anchors are recessed into the bows to reduce wind resistance. One recess can be seen in this illustration. The anchors weigh 16 tons each and are among the largest ever constructed fro an ocean liner. A graphic account of the romantic clipper ships whose mighty deeds have added such an immortal chapter to the story of the seven seas. The article includes a page showing “standing and running rigging”, and includes the colour plate of the Ariel. The article is by the consulting editor Frank Bowen. A full-page article illustrating the hull and standing rigging, and yards and running rigging. The drawings are almost certainly by the artist Mr K. M. Sibley. Endurance, devotion to an ideal, and sublime courage in the face of death are inseparable from Arctic and Antarctic exploration. These qualities were never seen to better advantage than with Shackleton’s 1907-1909 remarkable expedition to the South Pole. This is the first article in the series Epics of Exploration. It was written by Lt.-Com. R. T. Gould. The article concludes in part 2.